Royaume de Danemarck, qui comprend le Nort-Jutland divise en ses quatre Dioceses, le Sud-Jutland divise en ses deux Duches, de Sleswick et de Holstein, et les Isles de Fionie, Selande, Laland, etc. 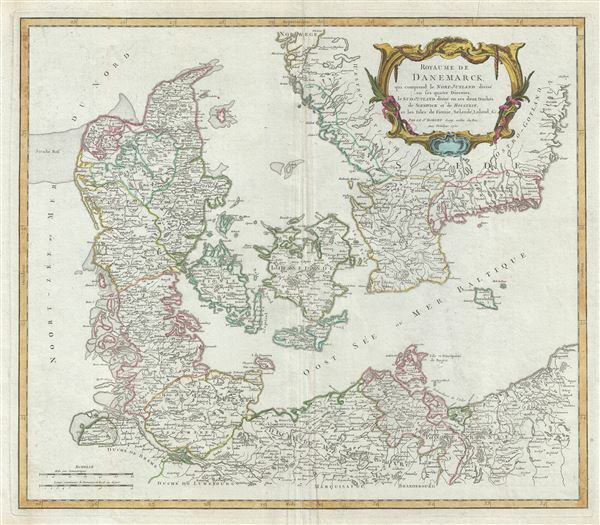 This is a scarce 1750 map of Denmark by Robert de Vaugondy. It covers all of Jutland and the islands of Zealand, Funen and Lolland. Parts of Sweden and Germany are also included. This extremely detailed map notes important cities, towns, rivers, mountains, roads and a host of additional topographic features. Undersea shoals and reefs are also noted. A highly decorative title cartouche appears in the top right quadrant. Drawn by Robert de Vaugondy in 1750 and published in the 1757 issue of his Atlas Universal. The Atlas Universal was one of the first atlases based upon actual surveys. Therefore, this map is highly accurate (for the period) and has most contemporary town names correct, though historic names are, in many cases, incorrect or omitted. Rumsey 3353.019. Pedley, Mary Sponberg Belle et Utile: The Work of the Robert de Vaugondy Family of Mapmakers, 72, State 1.